A delicious pumpkin pie dessert is just as good a pumpkin pie! I learned to make this dessert from my oldest sister. We have a big family so making a whole pan of dessert goes over really well and sometimes isn’t enough especially if they all love it. It’s turned out so good now that it’s a family favorite for the Fall holidays. 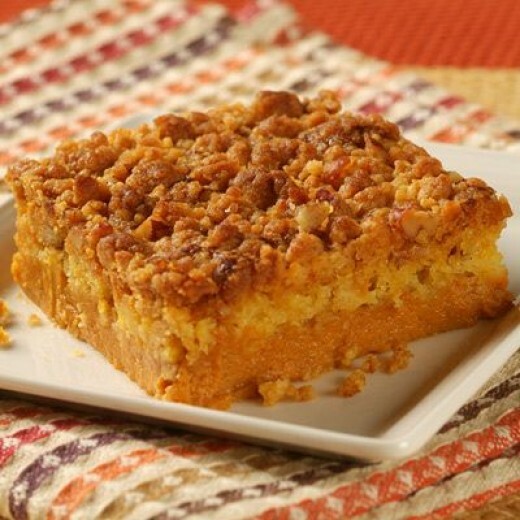 My younger son loves pumpkin so this is his all time favorite dessert hands down! I could make this anytime of the year for him and he’d be happy. This recipe is super quick and easy to make. All you do is just follow the recipe on the pumpkin can. If you have the 29 oz cans then use 1 can or if you have 15 oz cans then use 2. Just be sure to double the ingredients when you use the 15 oz cans. It’s pretty simple getting the batter made. The topping is easy too but you’ll want to keep an eye on it in the oven. Put it on the middle to low rack is my suggestion. Even though oven’s have the same temperature settings in numbers doesn’t mean they cook quite the same way. So keeping an eye on the topping part is a must so it doesn’t get too brown or get a burnt look. Mine has turned out with a bit of a burnt topping a few times. Then I was scraping at it a bit so it didn’t look bad but it didn’t taste bad so it was still good as ever. It’s a truly yummy dessert that you can’t resist! Just add some whipped cream on top and enjoy! I love to get it all made and baked up the night before the big meal. Then just warm it up a bit before serving. It is also good at room temperature. Either way its very good. What’s really neat is that not only is this served for Fall holidays but you can make it for National Pumpkin Pie Day! Pumpkin is a symbol of harvest time. It is a traditional North American sweet dessert that is eaten during the fall and early winter especially for Thanksgiving and Christmas holidays but is also featured for Halloween since that is a Fall holiday as too. In a small bowl mix sugar, salt, cinnamon, ginger and cloves. Stir in pumpkin and sugar spice mixture. Mix ¾ of a box yellow cake mix with one stick of softened butter until it is a crumbly mixture. Bake at 350 for an hour. Be sure to keep an eye on the topping so it don't get too brown or even a burnt look. Stick a tooth pick in the center to check the dessert. It should come clean. That will tell you it is done. If it's not clean then stick it back in the oven but keep and eye on it. Then check it again. Cool. Cut into squares. Enjoy!